You can currently only order online for delivery to the UK, and if you have a valid UK postcode. If you would like delivery to another country, please call us on 0845 4811 200. We have despatched goods to many other countries including Republic of Ireland, France, Germany and Portugal, we would be happy to discuss your requirements. Total single order values over £600.00 are carriage paid, single order values below £600.00 will incur a £25.00 standard delivery cost. Additional delivery charges, where applicable, will be added as detailed above. 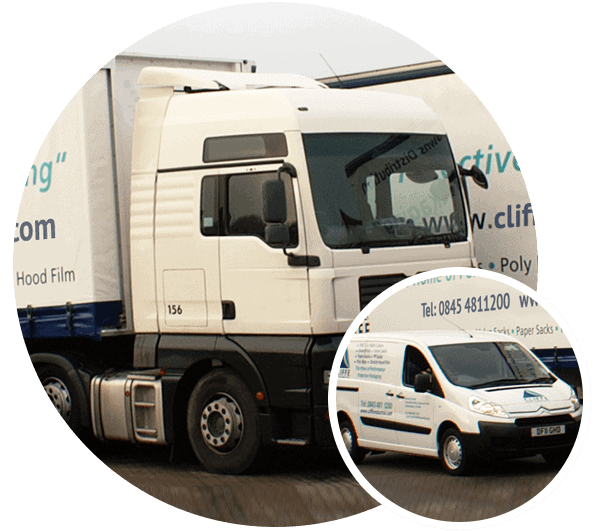 If you opt for goods to be left at premises without a signature being required, please be aware that Cliffe Packaging will not accept liability for damage that may have occurred to these goods. Standard delivery time for most products is three working days following the day of order. Saturdays and Sundays and official UK Bank Holidays are NOT defined as working days. Some products are available on a next working day delivery service if the order is placed and paid for before midday the previous working day. Most products will give details of how long delivery will take however if the timing of your delivery is critical we recommend checking with our office to confirm the instructions have been received and the status of the delivery. The company will make every effort to deliver products ordered on the agreed date, but, if for any reason the company is unable to deliver then no liability will fall to the company; whether in damages or otherwise, for delay of whole or any part of the goods ordered arising from any cause whatsoever. Delivery shall be conditional upon access free from encumbrances and good roads being available to the courier’s vehicles to the place of delivery. If the agent cannot gain access to the delivery address then additional carriage costs may be incurred. A number of our products are delivered on pallets in which case lorries are used and a kerbside delivery only can be guaranteed. We can by request use tail–lift offloads and hand pump trucks, therefore we can only offload on to a smooth hard standing area; we cannot offload onto pebble/gravel/cobble or soft ground. We will do our best to deliver as close to the property if access allows. We are not able to carry materials up paths or to rear gardens. Access to sites must be on hard roads over which a vehicle can pass without sustaining or causing damage of any kind.